Julie is a trial attorney specializing in business and real estate disputes, banking litigation, and insurance coverage disputes. She enjoys a reputation among her colleagues for success in the court room. She has long held an AV peer rating with Martindale-Hubbell. Since 2007 she has been named by her peers to the top five percent of all business litigation attorneys in the State of Oregon in the annual publication of Super Lawyers. She has also been selected by her peers for inclusion in The Best Lawyers in America for Commercial Litigation, Banking & Finance, and Real Estate Litigation. Julie acts as both a plaintiff’s attorney and a defense attorney, depending on the nature of the case and the needs of her clients. However, she represents only plaintiffs in insurance coverage disputes and property damage cases. Her clients cover the spectrum from individuals to national businesses. She also serves as an arbitrator for the Arbitration Service of Portland. 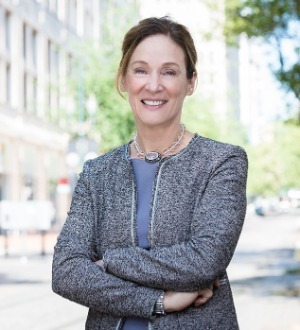 An active member of the Oregon State Bar, Julie has served on a number of committees, and is presently a member of the Uniform Civil Jury Instruction Committee. She is also a Continuing Legal Education speaker for both the Oregon State Bar and the Multnomah Bar Association.